I aspire to a daily writing practice, following my thoughts where they lead, planting seeds of ideas that may produce something more at a later date, documenting life’s everyday events—both ordinary and extraordinary. Many days I fail to write, excusing myself mostly because the practice is not firmly established enough to be a habit that I no longer have to prioritize. But sometimes I get the opportunity to write in the course of my day…a treat that reminds me of my intention. 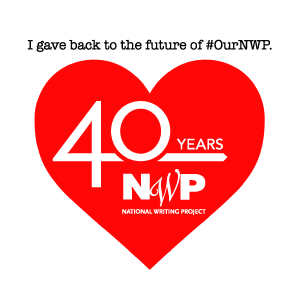 Last week as part of some work bringing National Writing Project (NWP) teachers and science museums together to consider ways they might partner to support students and teachers, I wrote. On my table a hotel coffee cup contained some small shells and a couple of hand lenses. We were invited to examine a shell, sketch, and write. Here’s my beginning thinking—the result of taking about five minutes to sketch and write. Layers of ridges that wrap the diameter and also extend along the length give the surface a spiky texture that I can feel as I roll the shell between my fingers. Spiraling up from a tiny sharp tip, an opening is revealed on one side of the widest part. Although I’ve seen a version of this shell many times, I don’t know who lives there or what it is called. I imagine a tiny snail carrying its home on its back, washed with the tides without a permanent resting place. Perhaps these creatures are the original Tiny House Nation, secure, bringing their homes—intricately assembled for efficiency and functionality—with them wherever they roam. I’m reminded again of the importance of establishing this daily practice, even if in tiny spurts—one I regularly espouse for my students and teachers I work with. Can I spare five minutes a day for writing? Of course, everyone has five minutes somewhere. Why don’t I write for five minutes every day? There are a million excuses—among them, the fear that I will need not five minutes but an hour once I get started. So today I’ve written another five minutes or more, moving this small piece from my notebook to my blog and adding a bit of context. I hope this is a catalyst for reestablishing that daily writing habit, even if for only five minutes a day. Today I will celebrate the tiny start and be reminded that small starts are betting than not starting at all. This entry was posted in clmooc, writing and tagged celebration, daily practice, habit, intersections, science, shell on March 22, 2017 by kd0602. As a friend of mine recently said in an email, this is a time when we get to witness a fuller blossom of our students. We get to see what they can do when given time and space and opportunity…if we give them time and space and opportunity. 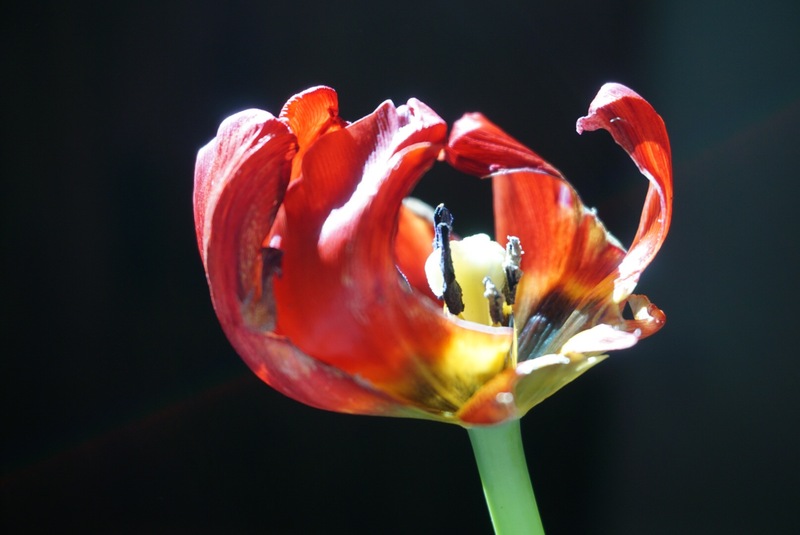 Like this slightly chewed and fully blossomed tulip, students open up at this time of the year. They dig into projects and expose their interests and thinking. They are enveloped in possibility. 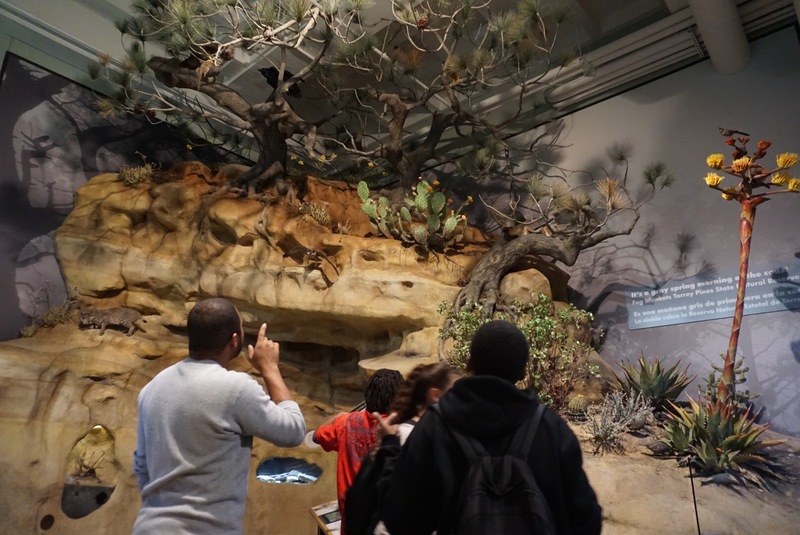 Our students recently went to the San Diego Natural History Museum on a field trip. 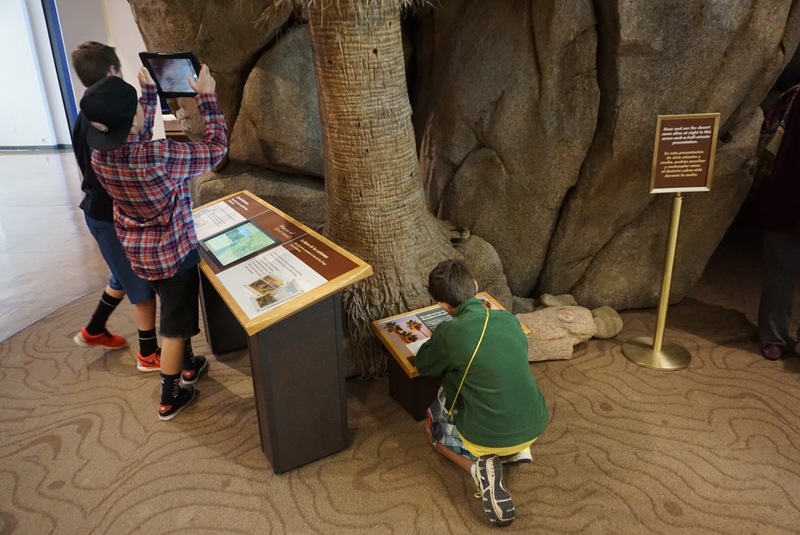 Their goal was to explore the new Coast to Cactus exhibit that features San Diego’s diverse ecosystems and find something that interested them. When they returned to the classroom. they researched this interest and then create a movie or blog post to teach someone else about what they learned. With time and a bit of technical support from us, our students inquired, composed, and created. 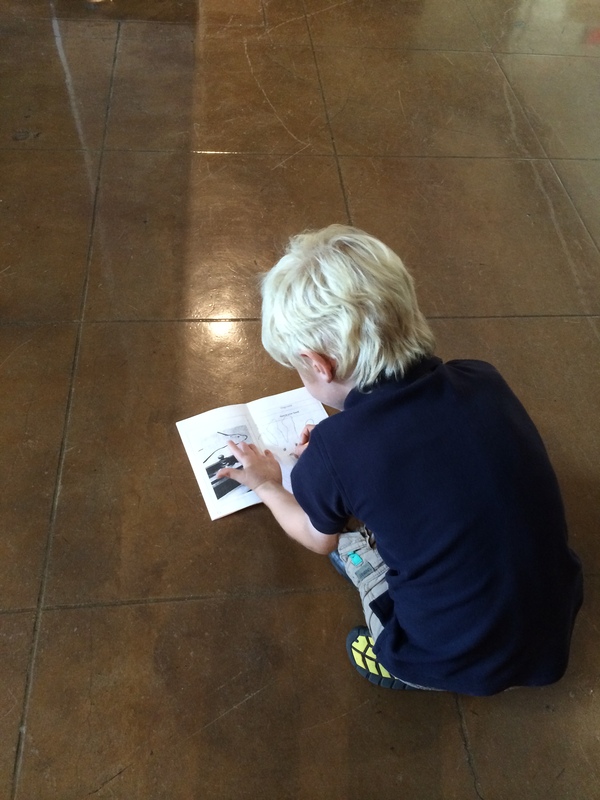 Eli (a second grader) noticed a mouse at the museum and couldn’t wait to learn more. And when he didn’t find the answers to his questions during his time researching in class, he went home and got his parents to help him with his research. He has also become our residence expert on iMovie…mentoring many of his classmates, helping them record and upload their own videos. Here’s his movie. And those two are just the tip of the iceberg of what is happening in the classroom. Our students have cross-pollinated, pushing each other to consider new possibilities. 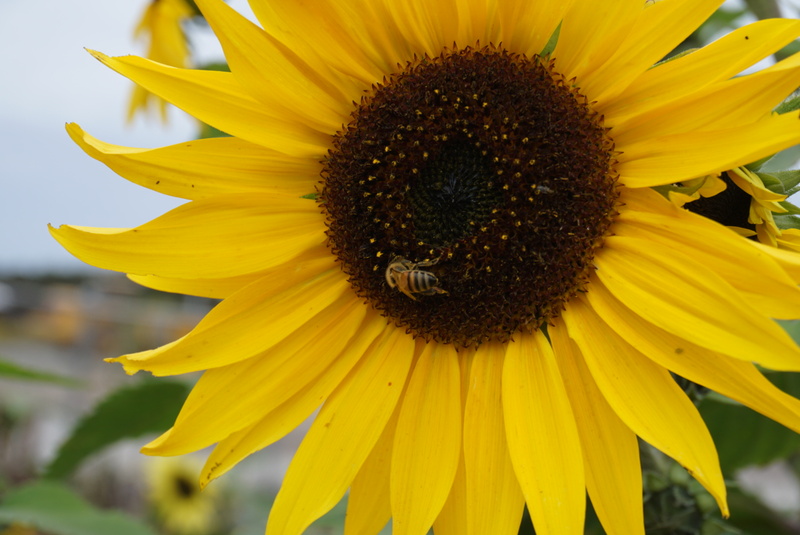 Like the bee on this sunflower, they depend on each other as they reach and strive for new heights, solidify what they already know, and reach with a helping hand to lift their classmates. They are enveloped in a community of learners that allows them to bloom, to stumble, and to get up and try again. And I am so lucky, because I am part of this community too…reaching and learning, enveloped in the energy and excitement of possibility. This entry was posted in celebrating and tagged envelope, intersections, learning, photo essay, photography, possibility, postaday, research, teaching, writing on May 18, 2015 by kd0602. As I spent the day at the San Diego Natural History Museum today, observing a group of high school students on a field trip, I found myself thinking about architecture. As the educator-researchers in our group discussed what we observed watching students during their field trip today, our conversation moved to the carefully planned structures that support students’ independence and dispositions toward learning. 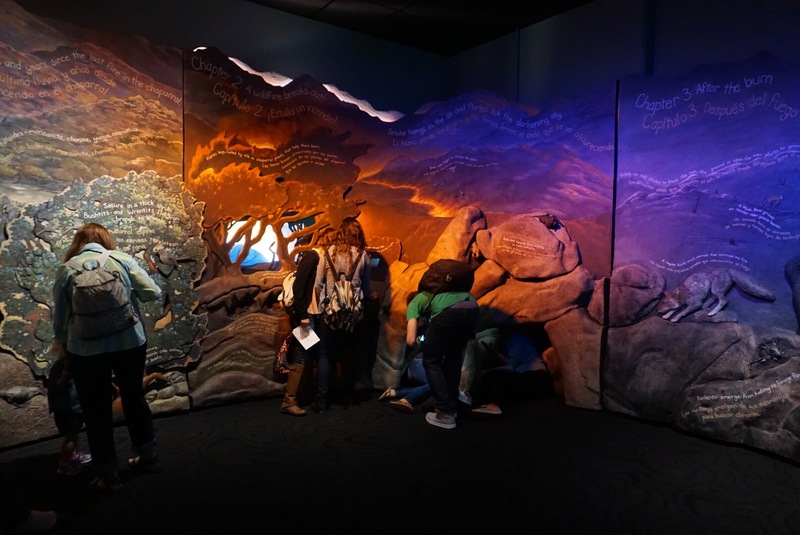 Field trips have traditionally depended on adult-centered structures that keep students “on-task,” ensuring that the trip has documented educational value in the form of completed packets of answered questions rather than trusting students to be interested in what they find in front of them. Over lunch, our Intersections leadership team chatted with an external evaluator–a part of our larger National Science Foundation grant– about our observations and tentative conclusions. And we found ourselves thinking about and talking about all the learning that happens that we are not able to document. When we take students outside the classroom, what are we hoping for? What can they learn that the classroom environment doesn’t offer? And why then, do we keep trying to make field trips more like school? As I look at this photo of a young woman using her cell phone to photograph an owl, I wonder how we encourage students to use tools and processes they use outside of school to support their own learning. How will this student use this photograph? What was she aiming for as she composed the image? How can students’ digital lives interact in positive ways with their school lives? And as my colleague described her understanding of the development of social capacity, a concept important in her binational work, my understanding of the learning that happens on field trips continued to evolve. A field trip is not a classroom lesson, it is a social event, a shared learning experience outside the school environment. And while students certainly learn some content, they are also developing social capacity–as representatives of their school and class in a public arena. They are navigating unfamiliar spaces, coming in contact with people they don’t usually see, interacting with adults–docents, volunteers, vendors, scientists, researchers–and exploring materials not present in their classrooms and schools. And in the best of situations they are figuring out how to interact with the space, people, and information in meaningful ways. I loved this informal game I observed today…a chaperone and his group spontaneously started counting the animals they spied in this coastal sage environment. Someone saw 9…and another saw 12, someone else saw 15. They started pointing them out to each other, looking closely, naming what they saw. And another researcher watched a pair of students challenge each other on the native/nonnative quiz in the patio area. The goal was to win…and the game was calling on prior knowledge and combining it with what they were observing in the exhibit. And they were having fun…being social, laughing, enjoying themselves…and learning. So what is the underlying architecture of a successful field trip…that structure that enables students to engage in learning on their own terms? That takes advantage of the place and the richness of expertise and artifacts that aren’t present in the classroom? And that honors the beauty and elegance of learning…not for a grade or a test, but because we are inspired and motivated to learn because we are learners–driven to make sense of our world, on our own terms. 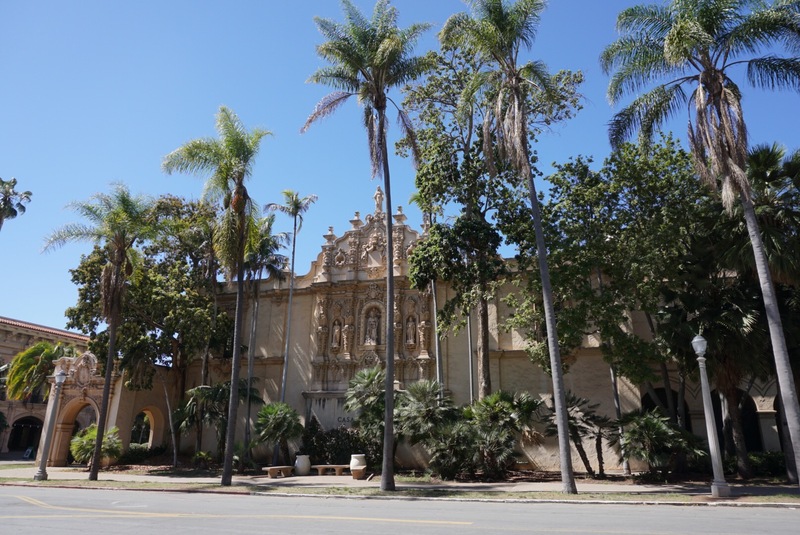 This entry was posted in Slice of Life, teaching and tagged architecture, Balboa Park, digital learning day, Field trip, intersections, photo essay, photography, reflection, research, San Diego Natural History Museum, SDAWP, writing on March 12, 2015 by kd0602. You all probably remember them, those iconic experiences of heading out on a school day with your classmates and teacher to a local museum or art gallery to extend and enhance what was going on the in classroom…a field trip! And in the best of times, those field trips are memorable, often motivating learning beyond the school curriculum. Maybe one of those experiences even fueled your passion for a particular field of study. But often, field trips are fraught with conflict. Are you heading out of the classroom to “do school” somewhere else? Is it a free day of fun with friends where the learning is incidental and accidental…if it happens at all? 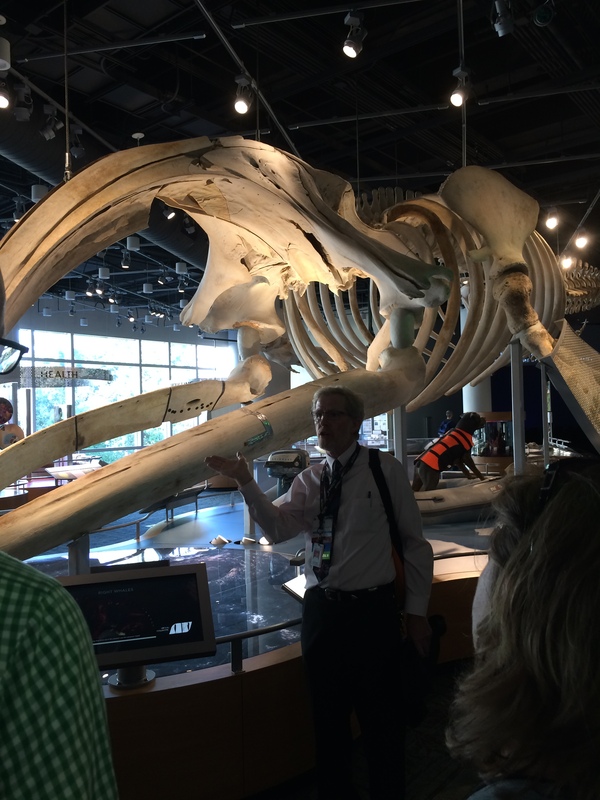 What role do teachers and museum personnel play in the field trip experience? What about chaperones? And what about students and their interests and passions? Through Intersections—a project funded by the National Science Foundation through the National Writing Project and the Association of Science and Technology Centers—the San Diego Area Writing Project, in partnership with the San Diego Natural History Museum and the Reuben H. Fleet Science Center,has been exploring the conflicts and tensions surrounding field trips. In our second year of investigating how to support student learning in the context of a field trip, we have learned a lot. Most significantly, we’ve learned the power of the interaction and co-learning of formal educators (those who work in school settings) and informal educators (those who work in out-of-school spaces like museums). We discovered that our goals for student learning are mostly the same, and through our interactions, we have reconsidered how we might achieve those goals. But first we had to let go of all that we have no control over–including exhibit layout and signage, field trip costs and transportation, and the uneven qualifications of chaperones, especially when it comes to facilitating student learning. We’ve decided this year to focus on ways to support students as agents of their own learning, depending less on the adults who accompany them and trusting that a rich museum experience will result in meaningful learning–even when students do not complete worksheets that ensure they have learned specific facts or answered a series of questions delineated by grade level standards. So we have asked teachers to prepare students for their trip by asking them to explore the exhibit, noting what interests them, and taking back interesting tidbits and lingering questions for further investigation through the creation of some kind of project back in the classroom following the trip. And to better understand how this works in action–with a variety of grade levels and school contexts–we are observing students in action through a series of field trip pilots. Today we observed sixth graders in action. 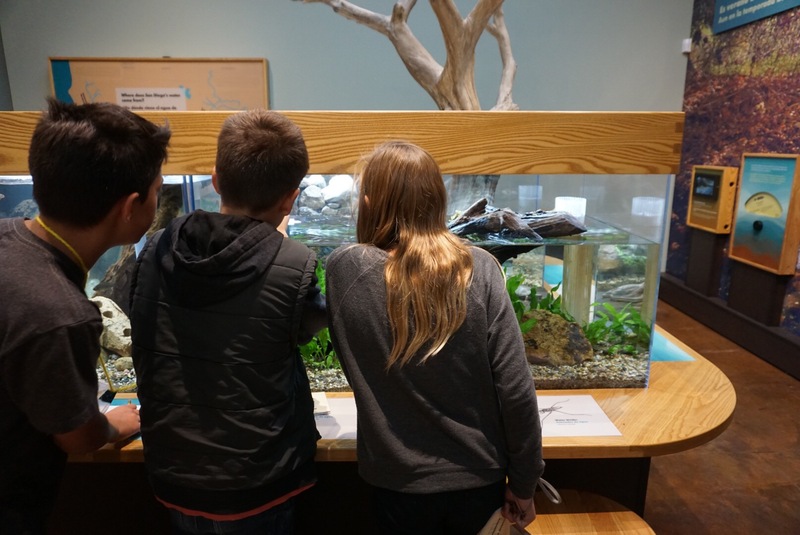 They came with a charge–to notice adaptations of plants and animals evident in the Coast to Cactus exhibit so they could create a project displaying their learning back at school next week. 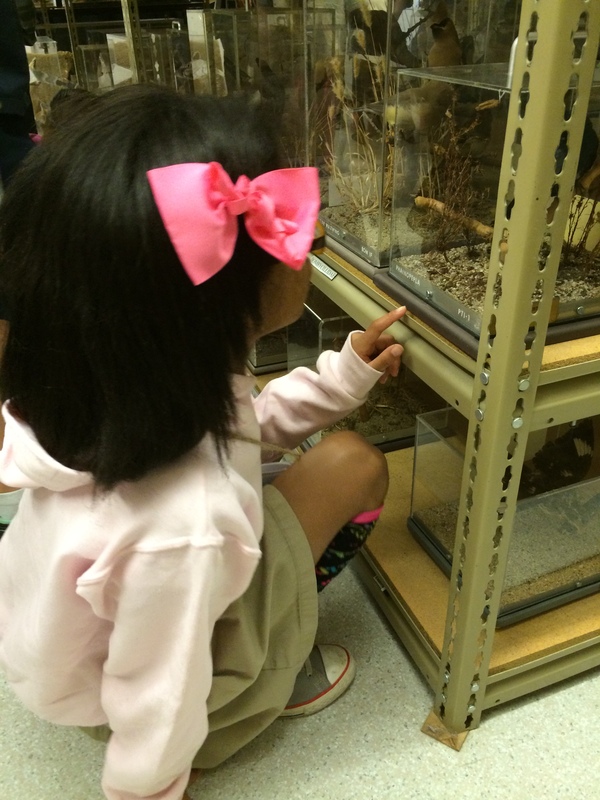 We watched students looking closely, in conversation with each other as they observed live animals in the exhibit. Students working alone, taking notes from the exhibit signage. And others in pairs and triads, some taking photos, others sketching, and some simply flipping buttons and spinning dials. 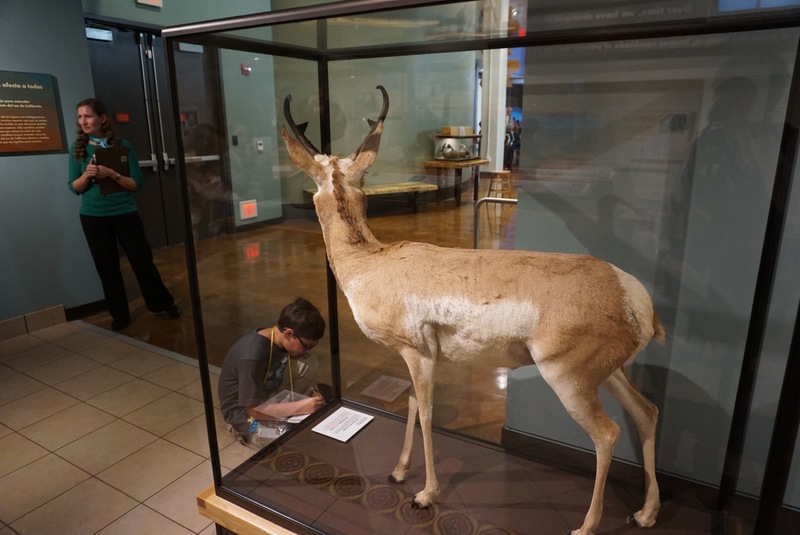 This student seems to be under surveillance by both the researcher and the stuffed deer as he takes notes from the informational placard. 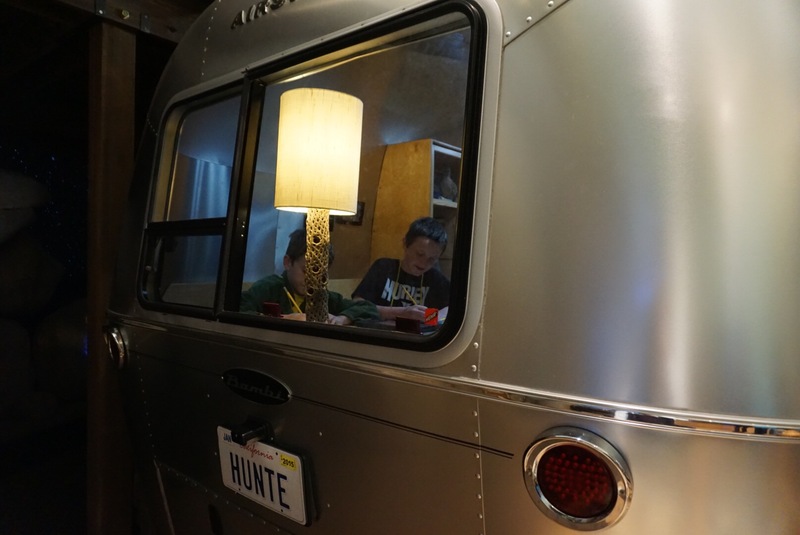 Some students found cozy nooks to meet and write–like inside this Bambi airstream that is a part of the exhibit. While others took a bit of time away to see how many boys would fit inside the hollow tree trunk while a classmate looked on and snapped their photo! And the questions linger. How much like school should a field trip be? 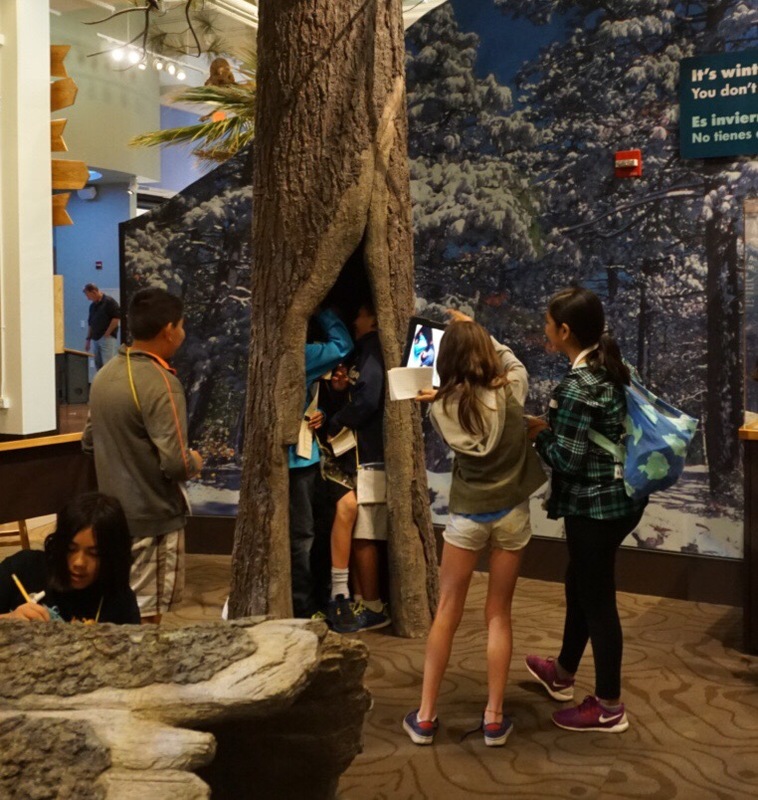 Do students need to “on task” by completing forms, taking notes, answering questions… Or can they be talking to each other, turning dials, inventing their own competitions and games related to the exhibits, crawling through tunnels and squeezing into tree trunks…and still be learning? Do they need to “do” the museum, reading each sign, looking at each artifact from start to finish? Or is it okay to focus their time and attention on the areas that most pique their interests? I’m interested in what these students will create when they head back to school. How will the visit to the museum influence their project? What will they remember most about this trip? Will they come back on their own, with their families? How would they use the museum if left to their own devices? We are paying attention to the intersections of formal and informal learning, of writing and science…and of student interest driven inquiry and teacher/adult directed learning. And with each pilot field trip, I have more questions about supporting student learning as we work to help students initiate and shape their own learning using field trips as a tool. How do you view the iconic field trip? 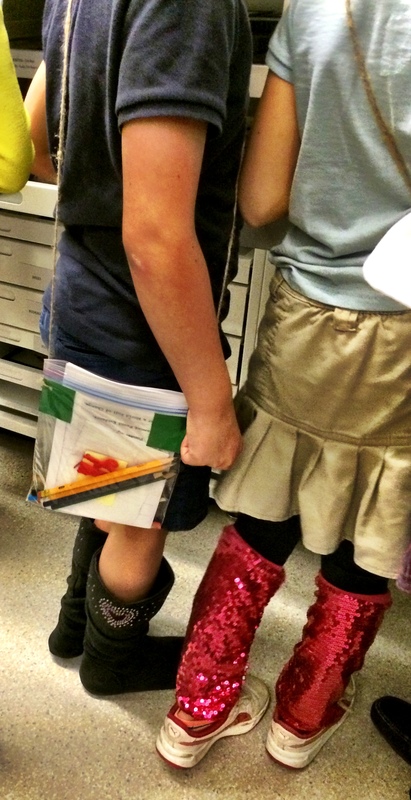 How do you prepare your students/your own children for out-of-school learning experiences? What outcomes do you hope for when you think field trip? We’d love to hear about your thoughts and experiences! 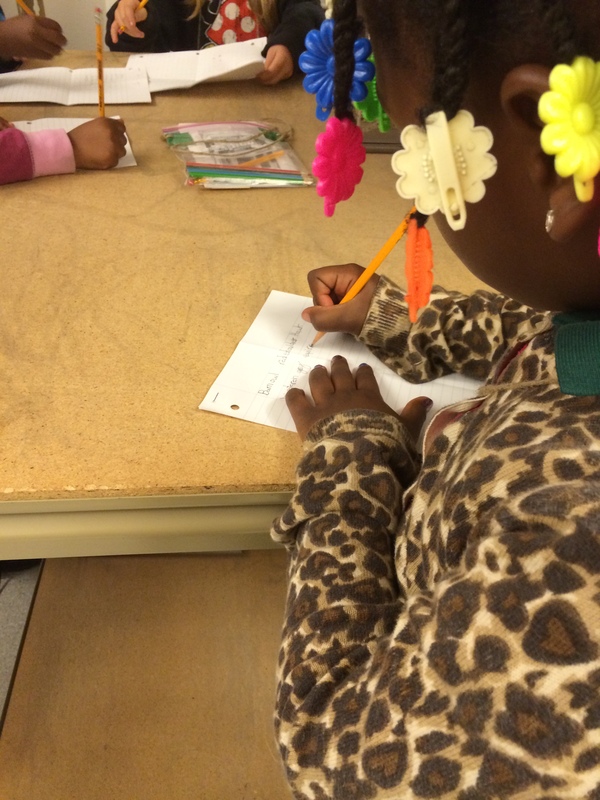 This entry was posted in Slice of Life, teaching and tagged Field trip, intersections, museums, research, science, writing on February 24, 2015 by kd0602. I had the opportunity today to see a museum through the eyes of people who helped to design it and nurture its continued growth. The North Carolina Museum of Natural Sciences is a gem. The museum is a combination of old and new, growing from a robust history of collection and curation to a modern space of interaction, interrelationships, research, and digital tools. There is something about a tour led by the director of exhibits who clearly loves his work and his museum that refracts the museum experience, bending the light in ways that allowed me to appreciate nuances of museum craft and scientific discovery and learning that I hadn’t considered before. 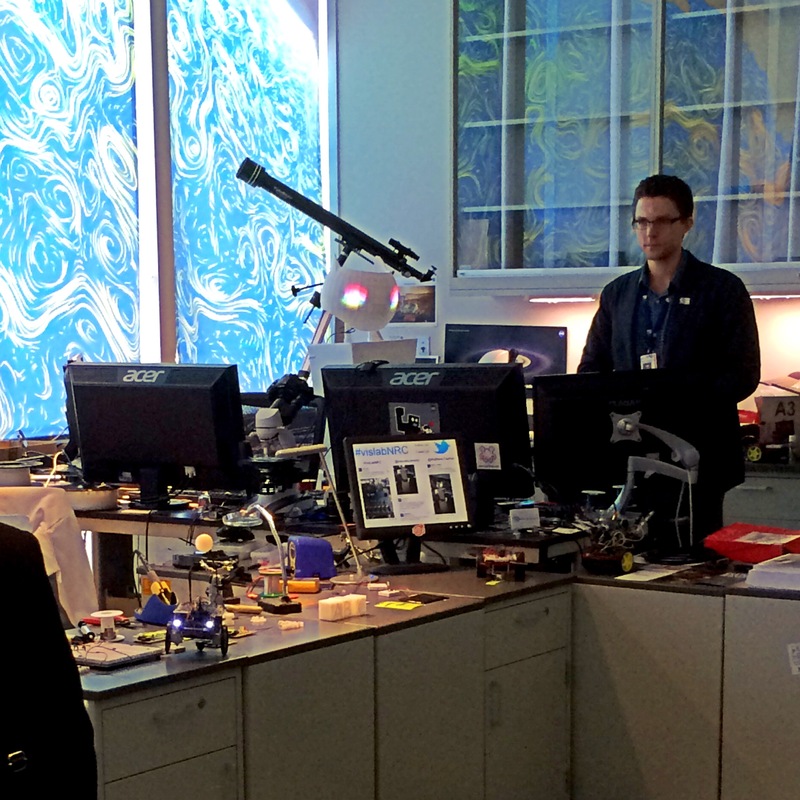 Having a working research lab in the middle of the museum (actually several of them) seems ingenious! 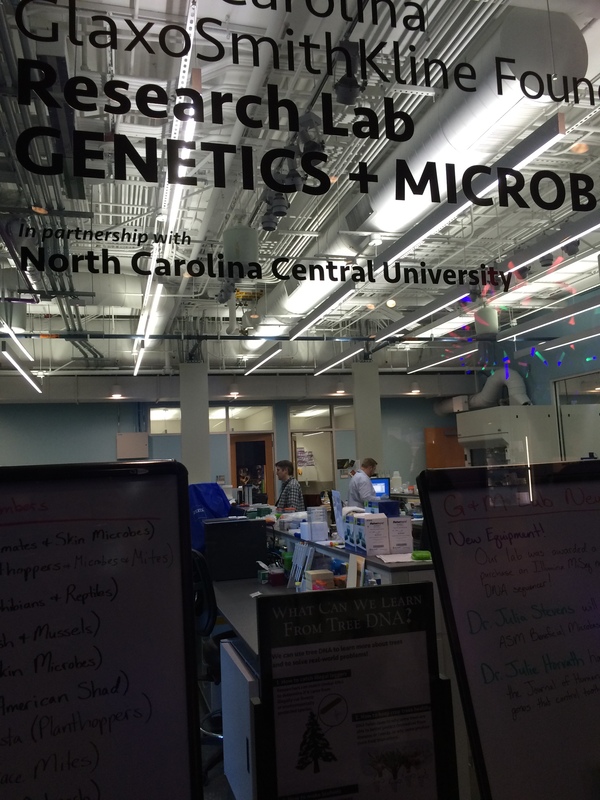 Partnerships with local universities bring scientists out into the open, working in modern, state of the art facilities behind clear class walls. Seeing scientists at work helps to demystify what it means to be a scientist…and they are able to interact with museum visitors, answering questions and explaining their work. 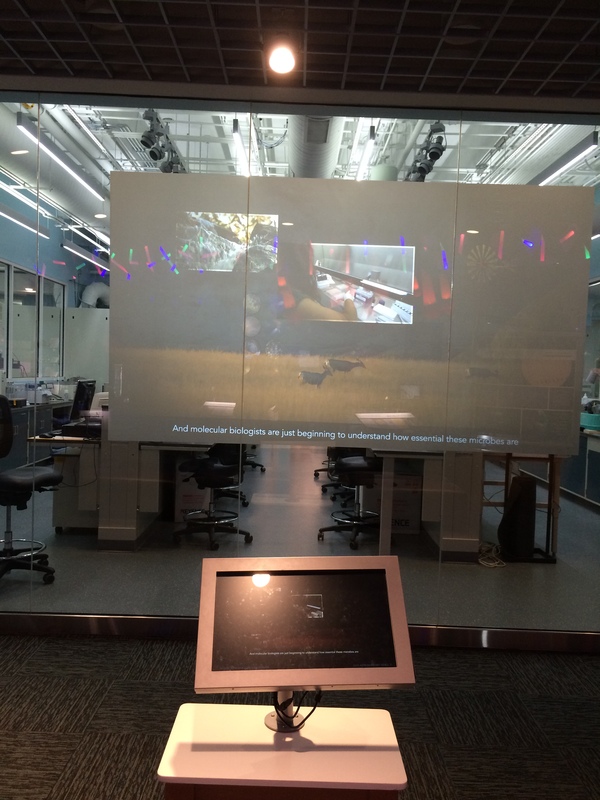 And this interactive projection allows the glass between the lab and the exhibit to nearly disappear, and also works as a tool for the scientists to use to explain their work with school groups and tour groups. Augmented reality and robotics allow young people access to difficult to understand concepts, using models they can virtually hold and manipulate as they watch atoms come together to form molecules or see the changes in the earth as it is impacted by fire, drought, and storms. This robot, whose head was printed using a 3-d printer, will soon be roaming the museum responding to questions asked by museum guests. The story of this right whale is both a tragedy and a triumph. Killed by a boat, its skeleton and that of its fetus were recovered and studied by scientists. Experiments to determine the speed a boat would require to break the facial bone of a whale and kill it resulted in legislation slowing boats during the migration season of the right whales off the Atlantic coast. Here’s a great example of science working to save a vanishing species! And in a unique space, short visual narratives mesmerize you with their beauty and fascinate you with their complexity. Balconies allow you to stop and watch from different locations and you can easily dip in and out of the viewing experience. 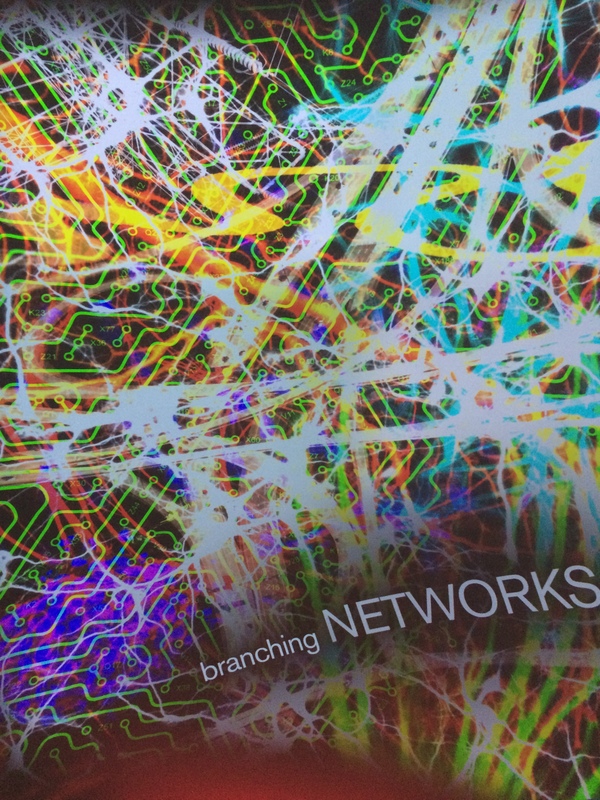 This sequence on networks grabbed my attention…I know i want to think more about the different kinds of networks in our lives, how they are similar and different, organic and manmade…and how light and movement help us understand them. 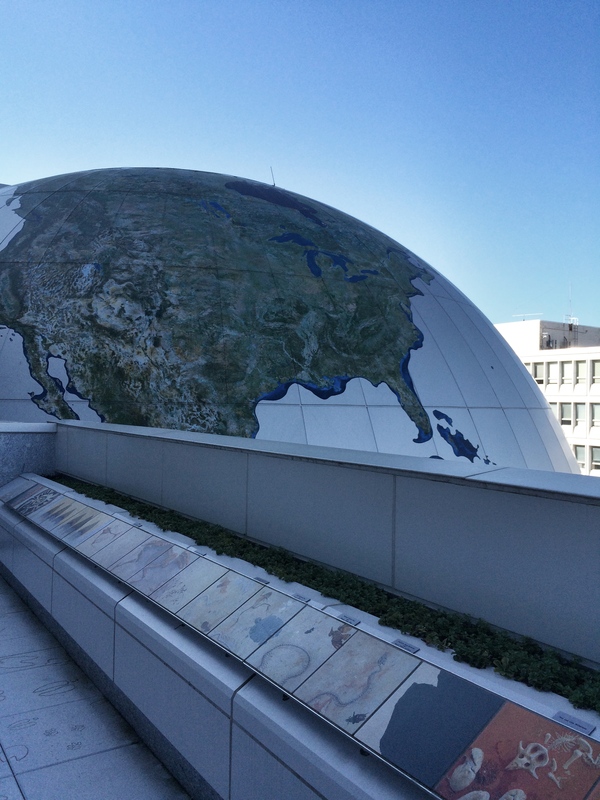 These mini movies were projected on the inside of a curved surface that just happens to be this extraordinary globe from the outside of the building…another interesting and beautiful way to learn about our world. Today’s tour allowed me to experience the museum in a new light, refracted by the passion of those who know this place intimately. This post only begins to scratch the surface of what I saw, heard, and experienced in my short visit. And I’m lucky, I get to return to the museum again tomorrow when it will be filled with museum people from all over the world as they socialize and learn from each other. I can only imagine what new insights I will gain as I return to this magnificent place of science, research, and learning. This entry was posted in thinking and tagged ASTC, intersections, learning, North Carolina Museum of Natural Science, photo essay, photography, refraction, writing on October 17, 2014 by kd0602. I feel like I have water on the brain. I woke this morning to images of water flowing–a water main break in Los Angeles had me gasping at the waste of a precious resource. Our drought in Southern California–in CA as a whole (and other western states)–is so severe that I feel the constant of thirst, in my throat, in my heart, for our plants and animals, for our people. Reservoirs and lakes have shrunken to show thick exposed shorelines, creeks are but a distant memory of a trickle. And the flooding in Colorado has me wishing we could share in this bounty rather than experience the extremes of water. Floods, like their cousins wildfires, remind us that there is much we do not and cannot control. I spent time today on the banks of the Clark Fork River in Missoula, MT learning and thinking about the indigenous stories of this place. The beauty of the river masks its troubled history and ancient lineage. Indigenous and scientific knowledge swim in these waters that tourists may see as a playground, a place for floating on inner tubes and cooling off in the 90 degree temperatures. Inspired by the water, I wrote with others as part of a mini writing marathon at our Intersections meeting today. The writing was rich and layered with stories of experiences with water…or no water. And changing the lens…through the indigenous stories and science…prompted our memories and connections, letting the stories pour like the water itself. Like water, there is power in writing. Power to connect, to heal, to think and reflect. We sometimes forget that writing in unexpected places, creates new urgency and agency for our writing. So go outside, find a place by a river, on the curb, under a tree, or even sit on the car bumper and see what writing comes when you change your lens. 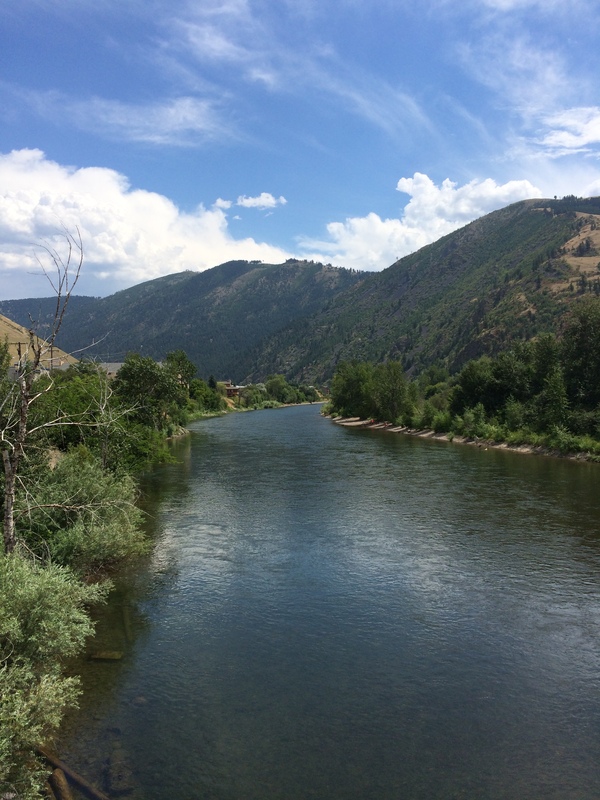 This entry was posted in clmooc, writing and tagged clark fork river, drought, intersections, iphoneography, Missoula, photography, science, water on July 30, 2014 by kd0602. It was quiet when I arrived, the coffee maker was percolating, the snake stretching up to explore its glassed-in space, and the empty exhibits waiting to be filled with the curiosity of children. 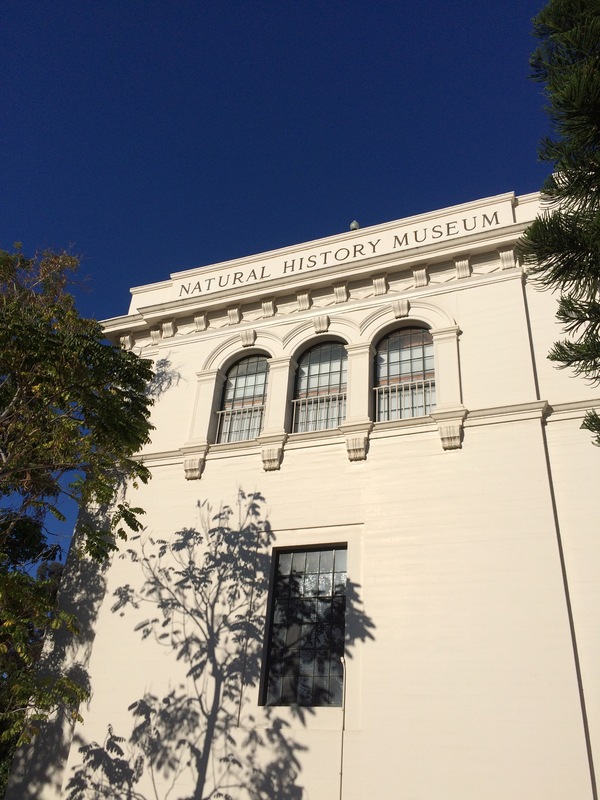 There’s something magical about an empty museum…an experience I have come to love through our Intersections work, a partnership between the San Diego Area Writing Project, the Reuben H. Fleet Science Center, and the San Diego Natural History Museum (the NAT). We, classroom teachers and museums educators, have been learning and working together throughout this school year to improve the field trip experience for students, and to explore the relationships between science and writing. And yesterday was our second field trip pilot, an opportunity to observe students, their teacher, and chaperones in action as they implemented the tools we developed to support the experience. These tools: a chaperone orientation video, exhibit guides, and questions to invite student inquiry; a hands-free field kit, question card, and exhibit booklet for students; and all the experiences the teacher–one of our participants–had through our year together, were meant to support student inquiry and encourage exploration. They were meant to support the parent volunteers/chaperones, helping them to facilitate student-driven conversations about their observations. And in many ways, these tools did help to support these goals. My favorite part of the field trip happened at the very beginning when students were treated to a behind-the-scenes tour of the Nature to You loan library at the NAT, a room filled with taxidermy animals, insect specimens, and a geologic collection that are available for teachers to check out and take to their classrooms. As we piled into the small space lined with glass cases of bobcats, birds, bats, possums, insects, and more, you could feel the energy. Students spontaneously began asking questions, “Are they real?” “Are they alive?” “How did they die?” After a brief explanation that in fact, all these animals are real, but no longer alive…and that they either died of natural causes or were found dead and then preserved through taxidermy, students were invited to explore the collection and to consider which animals they might like to have visit their classroom. The children and their chaperones spread throughout the room, eager to uncover the treasures within. 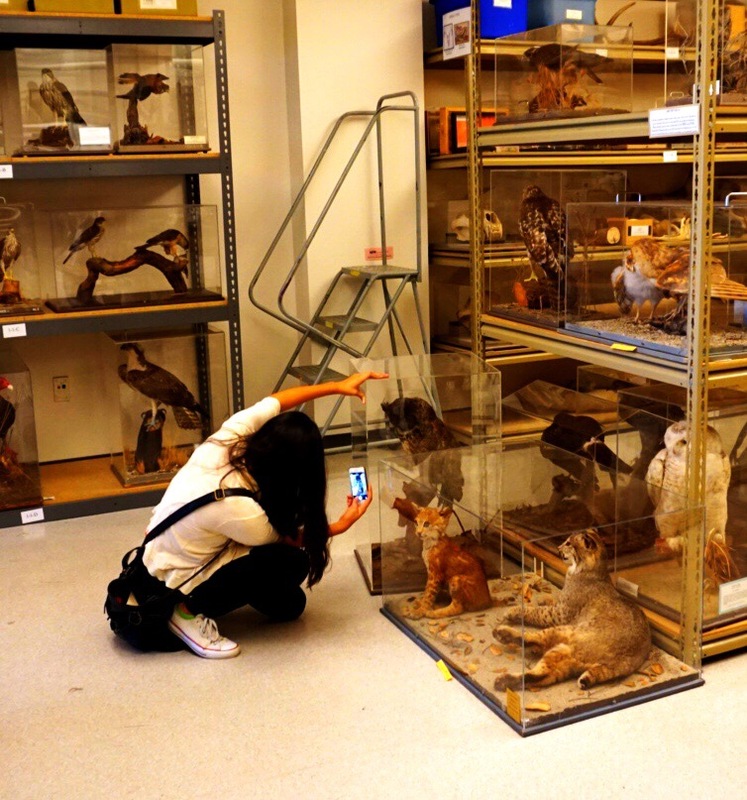 Student knelt down and bent in close to the glass, carefully observing the animals of interest. They told stories of animals they recognized…and their adult chaperones also told stories and pointed out animals of interest. Everyone seemed to find favorites and called their friends over to see their finds. 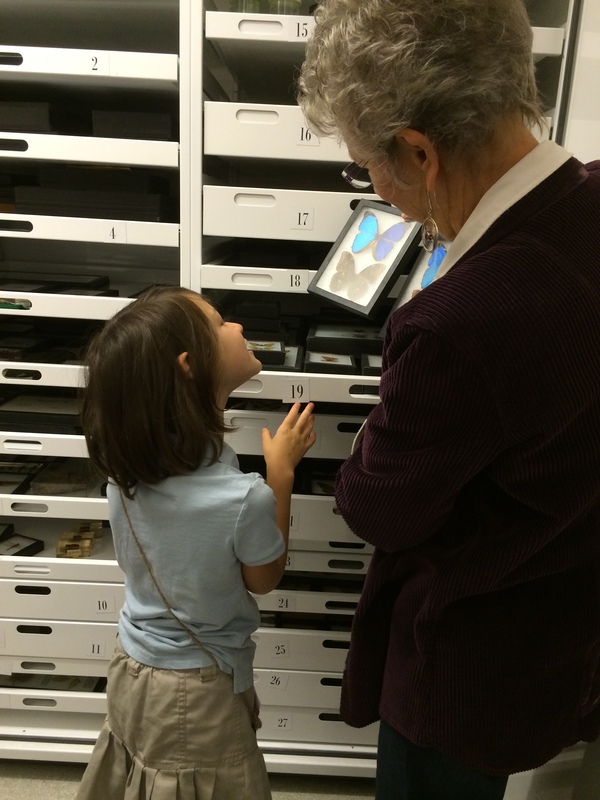 This little girl was fascinated by the butterflies and desperately wanted this specimen to come to her classroom. She asked if she could make a list of animals she wanted to bring back to school…and of course, she was encouraged to do so. Students spontaneously took paper out of the field bags and used all available surfaces: shelfs, carts, the floor… to write lists and other information they wanted to remember about these animals. As they exited from the loan library, students gathered into their small groups and headed off to the museum exhibits. They were free to explore in whatever order they decided, and our team of educator-researchers followed along, taking notes, listening in on conversations, documenting the museum experience. We noted the places where students lingered, where they seemed eager to spend more time and explore, and captured their questions and conversations where we could. I found myself interested in the structures and spaces of the museum, thinking about the strategic placement of benches and stools and the height of information boards. 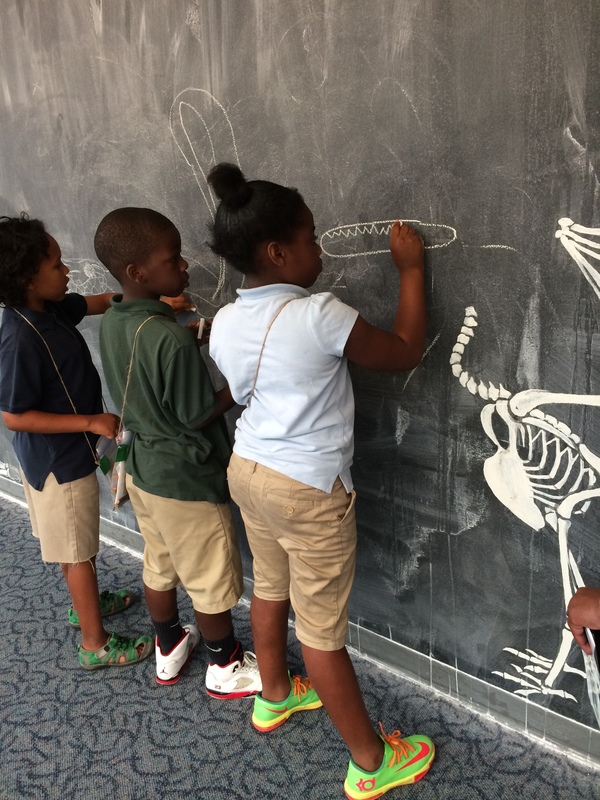 I loved watching students at this chalkboard that invited students to draw skulls that they had observed throughout the exhibit. And I noticed students sketching and writing in their booklets–a space intended to invite student observations and deepen their thinking. Unfortunately, in many cases students and chaperones seemed to view the booklet as a duty, often filling in spaces as quickly as possible with little thought and attention. I did notice a student or two take some time…this little guy made himself quite comfortable in the middle of the floor, as he sketched and completed a page in his booklet. 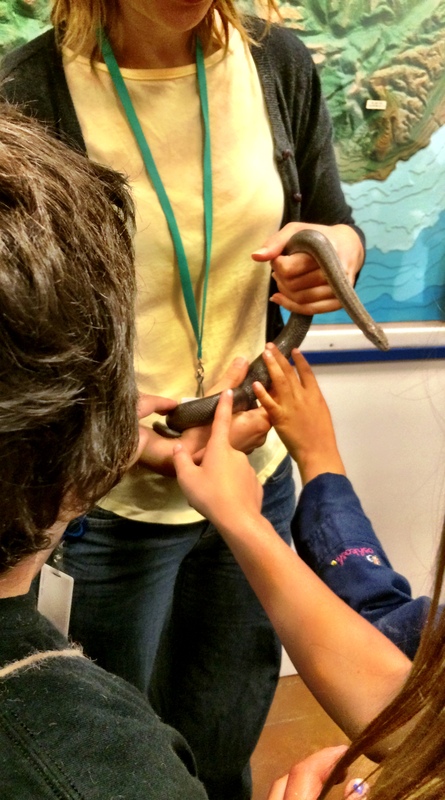 Before lunch, students had the opportunity to get close to a couple of snakes…and even touch them. They moved in close, asking questions of the the docent as they reached toward the snakes. After lunch, students headed off to the Fleet with the researchers in tow. We continued our documentation and observations. As the field trip wound to an end, the educator-researchers gathered in a conference room to debrief the process. Reviewing our notes, we thought about the positives of the field trip experience and the places we still felt a need for change and improvement. And then we gathered in groups and discussed our observations. The conversations were rich and dynamic, noting the places where we observed students engaged and inspired and still finding missed opportunities for students to be self-directed and to delve more deeply into the questions the exhibits provoked. This process of designing field trip tools, testing them in an authentic field trip experience, and then reflecting on the implications of our observations in order to iterate and innovate has been a powerful one. 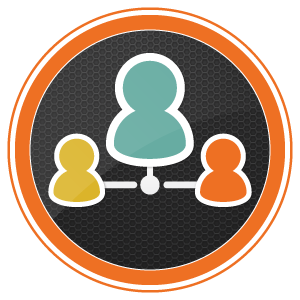 And while there has been frustration in our group that we haven’t yet produced a product that captures the depth and intensity of our work together, we have learned a tremendous amount and come to some startling ahas about the intersections of informal and formal learning opportunities. As much as we’ve tried to support chaperones to facilitate inquiry, the reality is many of our well-intended parent volunteers are not prepared for that role…and our “crash course” in juicy and probing questions isn’t enough to make them feel comfortable and confident in that capacity. Mostly, they do just what we asked them to do, they keep track of students, redirect them when needed, and deal with the safety and personal well-being needs that come with groups of children. So, we are rethinking our tools…again. And maybe we will never have the perfect product we wish for…and then again, maybe this process is the product we are searching for, an occasion to really see students in action and consider the roles we might play in supporting their curiosity, deepening their learning opportunities, and opening up time and place for playful exploration and inspiration both inside the classroom and in those wonderful spaces beyond the classroom walls. This entry was posted in teaching and tagged field trips, intersections, iphoneography, learning, museums, photo essay, photography, science, writing on April 26, 2014 by kd0602.